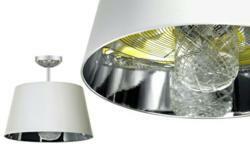 Summary: Lumens Light + Living introduces several new lighting products from top designers now available at Lumens.com. The Bloom Pendant by Kartell, designed by Ferruccio Laviani, is now available in the U.S. Lumens has also introduced the Mistral Ceiling Fan by Moooi and the Bocci 28 Series Lights by Canadian contemporary design house Bocci. Lumens Light + Living has introduced several new design lighting products from top brands that are now available at Lumens.com. Representatives from Lumens.com recently returned from Euroluce, the lighting exhibition at the Milan International Furniture Fair, where new products are exhibited by the world’s top designers. New products now available on Lumens.com include the Bloom Pendant by Kartell, the Bocci 28 Series by Bocci and the Mistral Ceiling Fan by Moooi. The multi-functioning Mistral Ceiling Fan by Moooi was showcased at Euroluce 2011. Underneath its drum shade, the Mistral Ceiling Fan features 5 yellow wood fan blades as well as an inner diffuser made of intricate cut glass, adding a prismatic accent to the light. “The great thing about this fan is that you would never guess it’s a ceiling fan,” said Ken Plumlee, CEO of Lumens Light + Living. “It’s a great fusion of a light with the functionality of a fan, under a beautiful shade that highlights the striking design we’re used to from Moooi.” The Mistral Ceiling Fan by Moooi is available with dark brown, white or off-white drum shades. The Bloom Pendant Light is manufactured by Kartell, a leading Italian manufacturer in modern polycarbonate lighting, furniture and home accessories. The Bloom was introduced in 2009 and just became available for purchase in the United States. 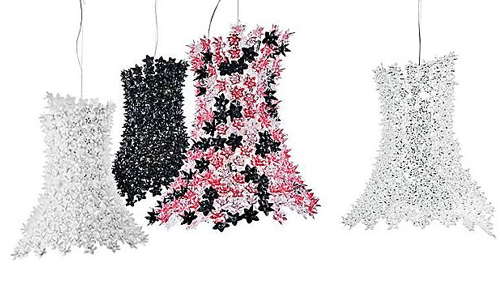 Designed by Ferruccio Laviani, the Bloom Pendant by Kartell showcases cascades of crystalline flowers in a new interpretation of traditional light. The Bloom Pendant is composed of a polycarbonate tubular framework encrusted with tiny double corolla polycarbonate flowers. A series of bulbs positioned along the internal framework diffuses beams of light through the petals and reflects off their faceted surfaces. The Bloom is available in several colors: matte black, matte white, transparent crystal and transparent pink-black. The Bocci 28 Series is the latest design from Bocci, designed by the company’s creative director, Omer Arbel. 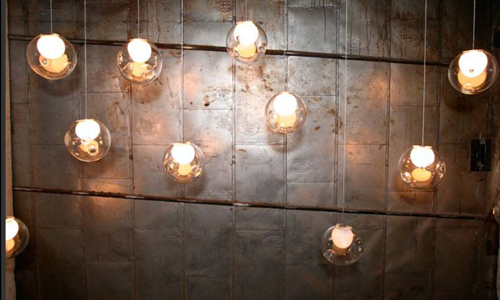 Bocci pendants are known for their attention to detail, designed to be clustered in groups to create the effect of many tiny candles incased in floating spheres of water. The 28 Series is the latest adaptation, featuring clear exterior glass in a distorted spherical shape with a milk white inner cavity. The design comes from a glass-blowing technique developed by Omer Arbel where air The 28 series is available in single pendants, clustered pendants and chandeliers, in LED and in custom colors. -More than 300 manufacturers, from contemporary lighting to transitional fixtures and modern furnishings, gifts and home accessories. For additional information on these products or Lumens.com, contact Sarah Schaale or visit lumens.com. Lumens Light + Living is dedicated to offering the very best of design-oriented lighting, fans and home accessories, from the most contemporary international designs to modern interpretations of classic design. Visit us on Facebook and Twitter.